While South Terrace Glover Playgrounds may have one of the most uninspiring names amongst other South Terrace playspaces, it does have one of the best playgrounds. 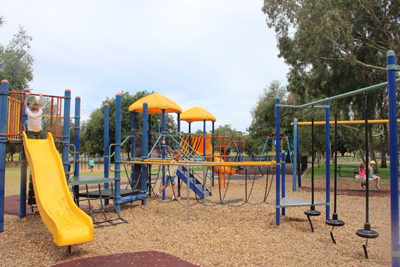 Located not too far from the South Terrace tram stop, this is a good playground to visit on any trip to town. The playground is fenced in, like all the playgrounds along the Southern Parklands, which can give you peace of mind amongst all those busy roads. It's also well prepared with a proper toilet block, a godsend at any playground. 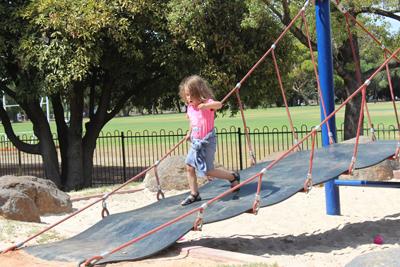 The main play area has swings (including a tire swing), slides, bridges, a climbing wall, and more. It's well spread out so that kids have plenty of room to run around while they also play. 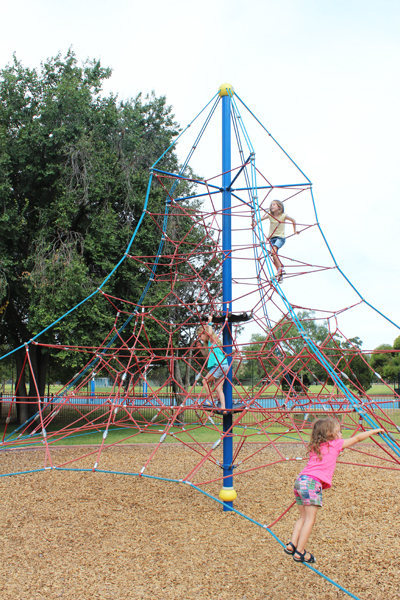 One of the highlights for older children or eager climbers is the large spider's web style climbing frame. 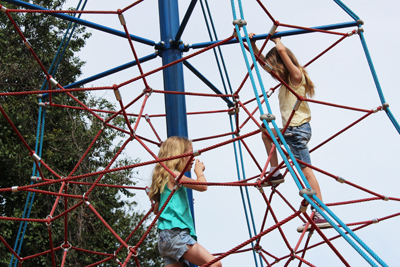 Kids can weave and climb as they make their way to the top. 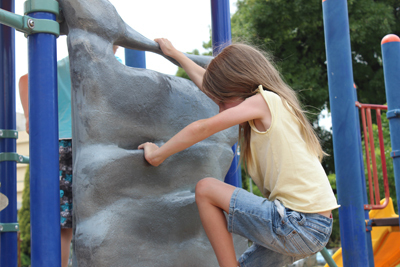 Younger kids might not be able to scale such heights, but they'll enjoy climbing around the lower levels. For younger kids, there is a sandpit. There are no real activities around the sandpit, except for the bridge that crosses over it, so if your kids are particularly fond of sand, consider bringing a bucket and a spade from home. There are also colourful pipe tunnels that are fun to go through or climb over. While there isn't a barbeque on site, there are shady picnic tables if you want to bring your own food from home. This part of town isn't really near many stores, so you're best bringing some food with you rather than relying on something nearby. Alternatively you can just make your way into town when you're done. 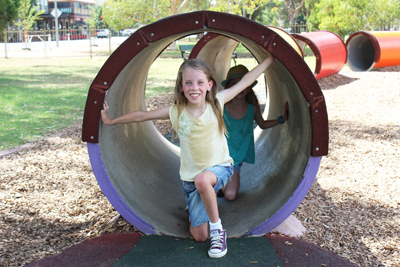 Overall the South Terrace Glover Playground has a range of different activities to keep kids interested, no matter their age. The 11-year old liked the tunnels the best, while the monkey-like 8-year-old loved the climbing frame. The 4-year old liked everything, as always, and the 13-year-old just liked that there was a water fountain. At the end of the day everyone left happy. Where is Adelaide's Best Children's Cafe?